The glamour world of Grand Prix racing is in throes of a revolution, one that will be televised around world. If the tough get going when the going gets tough, then the Formula One season starting in Australia next week should offer Sebastian Vettel ample opportunity to roll up his sleeves and play the paddock hard man. On the evidence of pre-season testing, the quadruple champion and his Red Bull team are up against it as the sport braces for an unpredictable new hybrid turbo era in Melbourne. “Right now it is not an easy situation, but there is no reason to hang the head,” said the 26-year-old German, who is bidding to become only the second driver after compatriot Michael Schumacher to win five titles in a row, as Red Bull wrapped up a troubled final test in Bahrain. “When I listen to some media we are right in the middle of a huge disaster…but we will fight through it. 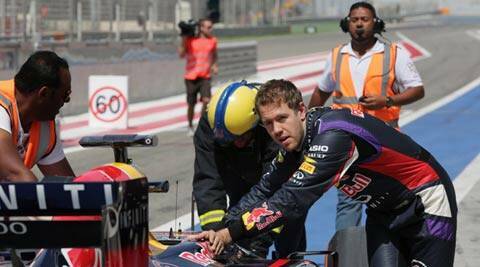 Everybody in the team – including me – is ready to fight,” Vettel said. The glamour world of Grand Prix racing is in the throes of a revolution, one that will be televised around the world, and Vettel is a young king whose throne is most definitely threatened in what could be a rollercoaster year. Success-starved rivals can sense their time has come, spurred on by rare signs of weakness from the once dominant team. The technical change is the biggest most of the sport’s engineers and mechanics have ever seen thanks to the introduction of a new turbocharged V6 engine with energy recovery systems. In this brave new world, Red Bull’s preparations have been little short of shocking with neither Vettel – who won the last nine races of 2013 and has not been beaten since July – nor his new and ever-smiling Australian team mate Daniel Ricciardo completing a race simulation. All the Renault-powered teams have struggled to log as much mileage as their Mercedes and Ferrari rivals – Cosworth having now disappeared as an engine supplier – after experiencing problems bedding in the new power unit. Reliability is a key concern for all teams, and the early races could be full of surprises with fuel economy coming to the fore and drivers playing a game of hare and tortoise to get to the finish. The big question is how quickly Red Bull will be able to overcome their problems and whether testing is an accurate reflection of what will come when the lights go out in Melbourne. Lewis Hamilton, whose Mercedes team are already the early favourites, expects Red Bull to be firing on all cylinders sooner than might be expected. “They look like they have a stunning car, and usually the more beautiful it is the faster it is so I’m sure they’ve got a pretty quick car this year,” said the Briton who won his 2008 title with McLaren. Mercedes-powered Williams – who have signed a rejuvenated Brazilian Felipe Massa from Ferrari to replace Venezuelan Pastor Maldonado – have also looked strong in testing after scoring just five points in a dismal 2013. Ferrari, reunited with 2007 champion Kimi Raikkonen in a lineup of champions with Fernando Alonso, have kept their cards close to their chest but the engine has looked reliable. Expect sparks between those two fire and ice characters, the first champions Ferrari has paired since 1954, if the car proves to be a championship contender. The same applies to Mercedes, where Hamilton and Nico Rosberg’s friendship could be sorely tested. Nothing, however, can be taken for granted. “We have seen cars struggle to do a race distance in pre-season but then finish the first race on the podium. We have seen it countless times and it can happen again,” Mercedes engine chief Andy Cowell told autosport.com. “ Melbourne is a very exciting step into this new world of hybrid F1. I really don’t know how it is going to unfold.